Everyone has a favorite customer service story, but few people can identify the specific behaviors that will result in outstanding service. With Becoming a Customer Service Star, employees and managers evaluate their behavior in 5 critical service areas, examine their attitudes about service, and learn ways to boost their customer service performance. Why are they our customers? What's my role in the service process? What makes customers frustrated - or delighted? What practical steps can I take to improve service? Generic enough to use with any type of industry and successful with all types of customer service personnel, the exercises are automatically and completely relevant because participants use their own examples and experiences. Team interventions to help celebrate a success or learn from a mistake. Most of the activities are short, typically under 20 minutes. Neatly organized in a 3-ring binder, each activity includes detailed, easy-to-follow instructions, checklists, worksheets, reproducible participant handouts, and discussion points. You can find Customer service training at HRDQ. Customer Service Week 2011 is October 4th-8th. This national event is devoted to honoring the people who serve and support customers. Give back to them this week to let them know how much you appreciate their kind efforts that keep customers feeling special, build customer loyalty and affirms your dedication to support their efforts to provide top notch customer service. A powerful and key component of an organization is great customer service. 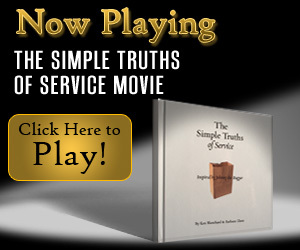 The movie, The Simple Truths of Service shares an inspiring story of service. The beautiful story of Johnny, the grocery store bagger truly captures the essence of service. It brings service and life into perspective. 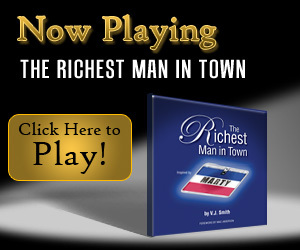 It takes only 3 minutes to watch it, and I truly hope you’ll share it with every person in your organization. Gifts for your customer service team ~ Thank your teammates that work each day to provide the very best customer service by giving them a framed inspiration to inspire them and remind them daily that you appreciate their efforts and dedication. The affiliate link below will take your visitors to the Framed Inspiration page where they can choose from over 70 different designs. KYSOS Today's customers want service that is faster, better, cheaper. But how do you know if your organization is prepared to meet that challenge? Find out with the Knock Your Socks Off Service (KYSOS) Readiness Assessment series. Based on best-selling Knock Your Socks Off Service® book series, this set of powerful training tools provides customer service managers and employees with valuable insight into their organization's ability to deliver world-class service — and helps them create an action plan for improvement. The Knock Your Socks Off Service Readiness Assessments are derived from an organizational culture and process instrument called the Service Management Practices Inventory™ (SMPI™). The SMPI is a 100+ item inventory that has been developed through rigorous factor analysis. The dimensions and items in the Knock Your Socks Off Service Readiness Assessments are the most useful and discriminate of the SMPI factors and items, with wordings adapted slightly for self-assessment and scoring modified from the 5-point Likert-type response scales used in the SMPI. Through a self-assessment, customer service employees and managers respond to 79 statements about customer service behavior and practices. The Employee Guide focuses on your employees' perceptions of their abilities — and those of the organization — to deliver KYSOS. The Manager Guide pinpoints developmental areas and helps customer service managers plan for improvement. Used together, there isn't a more powerful tool to diagnose your organization's readiness to deliver KYSOS. You can find KYSOS at HRDQ. How well are you meeting the challenges of providing service within your organization? Because internal service providers have a bond with their customers that external vendors simply do not share, they need to judge their behavior by a new standard. Unlike any other assessment on the market today, the Internal Customer Service Assessment illustrates the real differences between internal and external service. This 30-item assessment is designed to help internal service providers evaluate how well they are practicing the behaviors that constitute excellent internal service — and then assists them through action planning to improve those behaviors. The Internal Customer Service Assessment is based on relevant internal service literature and consulting experience. At the center of the assessment, the Internal Customer Service Model combines both aspects of the internal service provider’s job. The Model illustrates the dual focus on what is happening both inside and outside the organization. The assessment presents 30 statements about customer service. Individuals transfer their assessment scores to a chart, creating an Internal Customer Service Profile. This visual profile depicts strengths and areas of improvement in each of the 6 dimensions of internal service. The Participant Guides provide for both individual and group action planning and discussion. Spice up your next customer service training program with SkillBuilders: 50 Customer Service Activities, a creative, engaging, and innovative collection of skill development activities from Lorraine Ukens. The activities in this collection stimulate discussion and learning by actively involving all participants. Quick and to the point, these activities deliver powerful messages to your participants — helping them to understand customer expectations and develop the skills necessary to providing quality service. Change, Communication, Data Usage, Excellence, Negotiation, Perception, Problem Solving, Teamwork, & Product Contents. · A Close Resemblance · Acute Accuracy · Attending to Details · Body Talk · Box Score · Bumper Crop · Character Composition · Collective Connection · Country Time · Custom Made · Customer Account · Dig It · Double-Spaced · Eye Alone · Four to One · Guesstimation · Hidden Meaning · Hot Topics · In One Word · It All Adds Up · Make It Your Business · Matter of Choice · Mirror Image · Mystery Box · No Laughing Matter · Parallel Performance · Portraits · Post Office Box · Primary Colors · Questionable Events · Rate the R-A-T-E-R · Reporting for Duty · Rift Raft · Screen Test · Service Link · Service Search · Split Ends · Star Quality · Stormy Weather · Take a Letter · Talking Back · Thoroughly Complete · Toon-Up · Top to Bottom · Top Trade · Treasure Trove · Up in the Air · Very Wordy · Visible Outcomes · Wishful Thinking Go to HRDQ..
You want soft-skills training that gets results, training that addresses your specific needs, learning you can tailor to your audience, and you need it all at an affordable price. HRDQ Digital Download products are designed to meet and exceed those needs. Our digital products are easy to purchase and deliver. We cover a full range of topics and most are fully customizable!